Pittsburgh: Bernie Sanders for President: Yes, He Could! 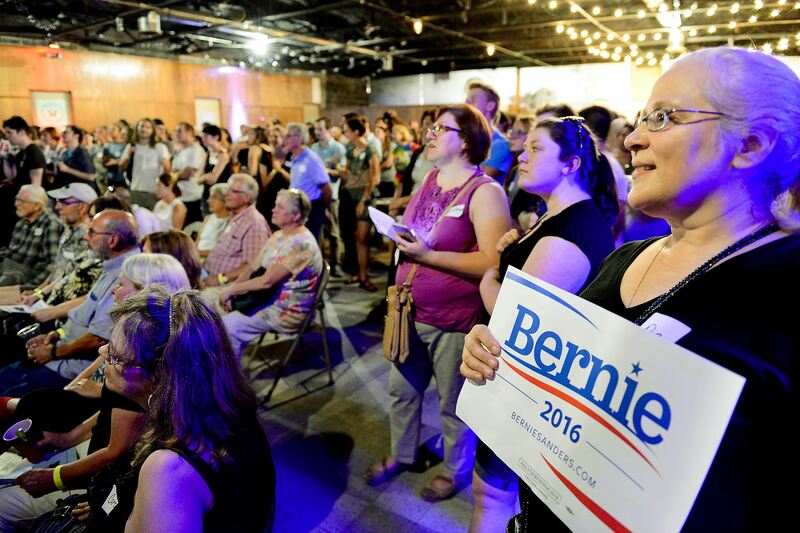 July 31, 2015 – Vermont Sen. Bernie Sanders has more than a few fans in Pittsburgh, judging by the turnout for his first televised meet-up since his poll numbers began shifting in a positive direction nationally. The muggy Wednesday evening air did its best to discourage a line from forming outside the Spirit Lounge on 51st Street in Lawrenceville, but 350 supporters squeezed into the former Moose Lodge that had once been the home to many a studio ’rasslin’ night. After ponying up the suggested $5 donation at the door, the cross-generational crowd of Democrats and fellow travelers jockeyed for the best vantage point in front of a projection screen on the east end of the hall. Mr. Sanders would televise his remarks to 3,100 similar gatherings across the country from an apartment in Washington, D.C., shortly after 7 p.m. Eastern time. According to organizers, Mr. Sanders would be addressing as many as 100,000 supporters nationwide — a number that should concern the complacent Democratic establishment, even though the insurgent candidate trails former Secretary of State Hillary Rodham Clinton by as much as 40 points in some polls. Still, Bernie Sanders has roughly the same level of name recognition that Sen. Barack Obama had at this point in his underdog campaign against Mrs. Clinton. 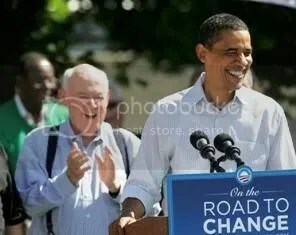 Unlike Mr. Obama, who was still trying to justify his candidacy to skeptical black leaders already committed to Mrs. Clinton in the summer of 2007, Mr. Sanders is drawing more energetic and enthusiastic crowds than Mrs. Clinton — a sign that the party’s progressive and liberal base is hungry for something it isn’t getting from its presumptive front-runner. There is still time for Mrs. Clinton to ignite the passion of grass-roots Democrats, of course, but Bernie Sanders is on fire right now in ways no other candidate for the nomination can remotely claim. When he finally appeared on screen to make his speech, there was a collective roar from the crowd that felt almost primal — a mix of sweat, genuine giddiness and exasperation that it has taken so long for a candidate who shares their deepest convictions and disappointment with the status quo to finally emerge. Technical difficulties with the live stream signal on Pittsburgh’s end prevented him from being heard at first, but when his Brooklyn-forged accent finally broke through the buffering silence, the crowd was primed to hear the candidate declare his allegiance to their issues and priorities. “The American people are saying loudly and clearly — enough is enough,” Mr. Sanders said after ticking off a series of priorities that would occupy his days in the White House. The candidate would return to this mantra many times after promising to reverse 40 years of middle-class decline and income inequality, raising the minimum wage, affordable college education and combating the “real unemployment rate” he insisted was over 10 percent. HARRISBURG — The Pennsylvania House of Representatives has returned to Harrisburg as Gov. Tom Wolf and top Republican lawmakers were set to resume face-to-face meetings to discuss a three-week-old budget stalemate. No major votes were expected today. The Democratic governor and Republicans who control the Legislature are sparring over competing budget proposals. Mr. Wolf is seeking a multibillion-dollar tax increase to deliver a record funding boost to schools and wipe out a long-term deficit that’s damaged Pennsylvania’s creditworthiness. Republicans passed a zero-tax increase budget with a smaller boost for education, but Mr. Wolf vetoed it, saying it didn’t meet his goals and used gimmickry to balance. The stalemate has left the state government without full spending authority. That includes payments to schools and nonprofits and county agencies that help administer Pennsylvania’s social-services safety net. During a regularly scheduled appearance at KDKA-AM radio in Pittsburgh today, Mr. Wolf said that bad state budgeting is costing taxpayers about $170 million a year. Mr. Wolf said state government is paying a premium of about 1 percent interest on $17 billion in debt. He linked the extra borrowing cost to five credit downgrades that Pennsylvania has received in the past three years. In the meantime, Republicans are complaining about a $750,000 ad campaign by an affiliate of the Washington, D.C.-based Democratic Governors Association that is targeting them in the showdown. The affiliate, America Works USA, has not disclosed the source of the money. Mr. Wolf and Republicans are sparring over competing budget proposals during the stalemate, which has left the state government without full spending authority. That includes payments to schools and nonprofits and county agencies that help administer Pennsylvania’s social services safety net. Mr. Wolf is seeking a multibillion-dollar tax increase to deliver a record funding boost to schools and wipe out a long-term deficit that’s damaged Pennsylvania’s creditworthiness. Republicans passed a zero-tax increase budget with a smaller boost for education, but Wolf vetoed it, saying it didn’t meet his goals and used gimmickry to balance. Thanks to social media campaigns and behind-the-scenes work from the Progressive Democrats of America, Sanders’ chances at president have become a reality. "Bernie is a no-nonsense guy who says what he believes and has legislation to back up what he believes." July 13, 2015 – In late April, when he announced that he would enter the presidential race, Bernie Sanders was the relatively unknown junior U.S. Senator from Vermont. Now he’s everywhere. Though the “Sanders surge” seemed to come from nowhere, it was long in the making. Sanders’ rapid rise in the polls, and his increasing visibility over the past few weeks, are in part the result of behind-the-scenes work by organizations like Progressive Democrats of America (PDA). PDA was founded in 2004 by progressives at the Democratic National Convention who were disappointed with the party’s presidential nominee, John Kerry, but were unwilling to give up on electoral politics. One evening, at the convention’s conclusion, about 200 people met to chart a path forward. PDA now has about 90,000 people on its email list. Of those, about 35,000 members actively support and participate in its work. It is funded by donations from its membership. 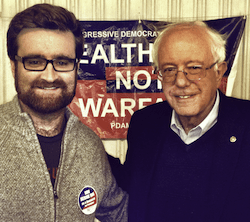 In early 2014, PDA began a petition drive to persuade Sanders to run for the presidency. When Sanders attended its tenth anniversary celebration in May of that year, PDA presented him with the petition. That event marked the beginning a strong push by the organization to encourage him to run for the Democratic nomination. Along with its sister organization, People Demanding Action (which focuses on advancing a policy agenda rather than electoral politics), PDA’s priorities are healthcare reform, campaign finance reform and environmental and economic justice. 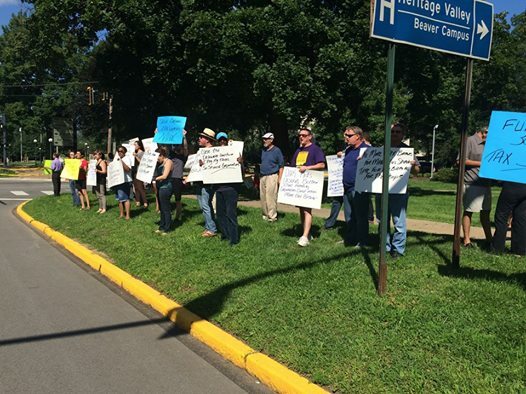 July 10 2015 – WASHINGTON (PAI) – Hundreds of retirees, in D.C. for the legislative-political conference of the Alliance for Retired Americans (ARA), gave a warm welcome to Sen. Bernie Sanders, Ind.-Vt., who is challenging Hillary Clinton in the Democratic primaries. They began with chants of “Bernie! Bernie! Bernie!” and interrupted his speech with several long – and unprompted-standing ovations. The enthusiasm of the ARA delegates is important: The union-backed organization has 4.3 million members in every congressional district nationwide. And those retired unionists in turn represent the consistently largest and most-active political constituency in the U.S. – Democratic, Independent or Republican – the elderly. ARA delegates gave Sanders — a down-the-line supporter of unions, workers and their rights, the elderly, Social Security and Medicare — thunderous applause as he reiterated those stands. After his speech, delegates spent their afternoon lobbying for those causes, too. Sanders knew what the crowd wanted, which is what he has preached for his 24-year career in Congress and what he gave to the ARA on July 9: An active endorsement of their goals. 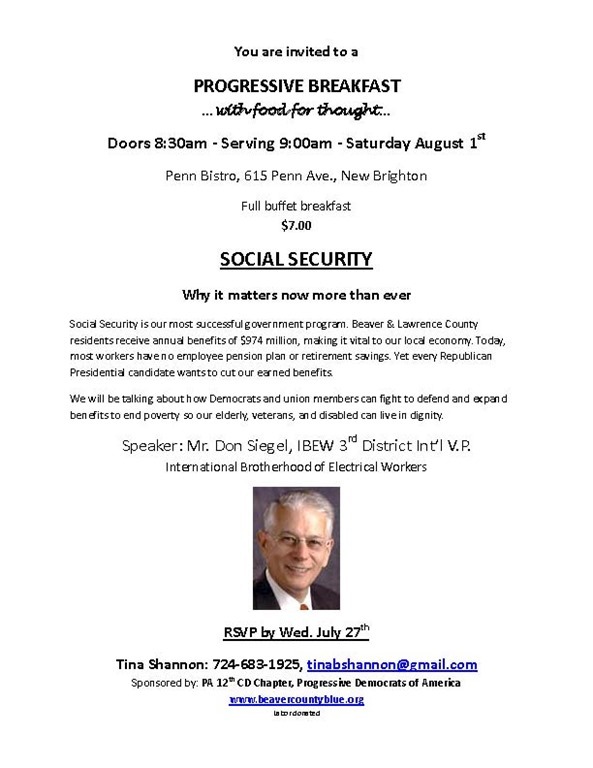 He and the delegates are led by protecting and expanding Social Security – by scrapping the wage cap on income taxed to provide for benefits and using that money to pay more to beneficiaries. The American people want that, too, Sanders declared. “Because of the ARA and other groups like it and because of the trade union movement, there was a poll two weeks ago in the Wall Street Journal, where 61 percent of the people said ‘lift the caps,’ while 20 percent opposed,” he added, to cheers. 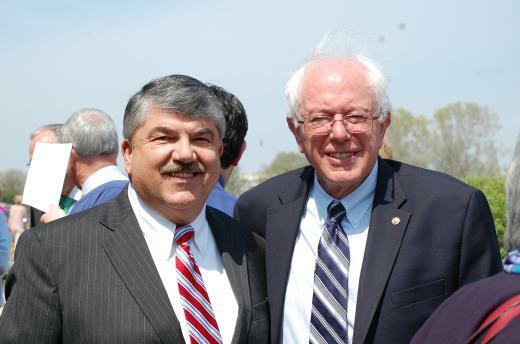 AFL-CIO chief Richard Trumka is warning labor leaders to hold off on endorsing Sen. Bernie Sanders’ bid for the presidency, saying the federation’s bylaws specify that such endorsements are to be left up to the organization on a national level. Trumka, in a memo sent out this week, reminded groups that they are not allowed to “endorse a presidential candidate” or even work on statements or resolutions that indicate a preference for any candidate, reports Politico. Further, he said that “personal statements” are also forbidden. “Because in years past, and already this year, a number of questions have been raised,” Trumka said, “I want to remind you all that the AFL-CIO endorsement for president and vice president belongs to the national AFL-CIO. Under the organization’s procedures on endorsement, a political committee makes its recommendation to the executive council in Washington, which then submits it for ratification by leaders of its member unions. A two-thirds majority is required to approve the endorsement. Trumka said the AFL-CIO had sent out questionnaires to both Democrats and Republicans, with a Friday deadline, and plans to interview candidates during its July executive council meeting. National union leaders, though, are drawn to the party’s more progressive side, represented by Sanders, an independent running for the Democratic nomination, and groups in South Carolina and Sanders’ home state of Vermont have already passed resolutions that support him. Some union leaders in Iowa are also calling for a resolution to be passed at their convention in August to back Sanders.